Whenever Formula One comes to Silverstone, you can expect incidents of some kind. Last year we had exploding tyres, this year, we had a one hour red flag period to delay the racing action. 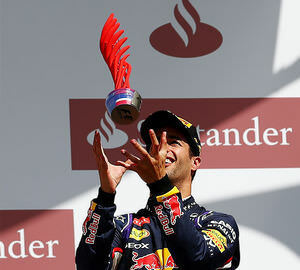 Nevertheless, it was a good solid race this year, with plenty of overtaking to keep us entertained. It wasn’t all about that first lap incident, either, here are a few things that caught my eye, both on and off track. The trophies come under a lot of scrutiny these days, particularly as many are shaped after the race sponsor instead of a more traditional design – or at least a nice cup-shaped piece of silverware. At Silverstone, the trophies were made of some kind of wibbling red material that broke almost the moment Lewis Hamilton got his victorious hands on it. He complained, and many watching weren’t impressed. Race sponsor Santander later clarified that the designs were a competition winning entry from students, and the trophy wasn’t quite as sturdy as it might have been because they had to compromise to accommodate the design. Which might have been okay if they had said as much up front, making a song and dance about the competition itself (which I didn’t know existed) and the winning design afterwards (which we barely got a chance to see before it broke). Apparently the sponsor themselves was embargoed on talking about the trophies until after the event, which seems a very odd state of affairs. Lewis wasn’t very impressed with the winning entry, although happy to be in the position to see it close up, of course. Hamilton eventually got his hands on the more traditional gold trophy and once he had that in his hands, the Brit was exceptionally happy with his weekend’s work. Kimi Räikkönen’s accident made for terrifying viewing and how grateful we all are that it turns out bruising is the extent of the injuries from such a crash. There were several ways it could have been much worse, including if Felipe Massa hadn’t had such quick reflexes, if Kamui Kobayashi hadn’t had enough room to escape the incoming Ferrari, and worst of all if Max Chilton had been an inch the other way. What ifs make up a big part of discussions about Formula One, because there are so many variables that go into each race weekend. What if analysis of an accident can be a gruesome business but is required if improvements are still to be made. Watching slo-mo footage, and viewing other angles, of the crash show that one of the wheels from Kimi’s car made its way across the track, bounced off Max Chilton’s car, and went back the way it had come. The tethers on the Ferrari did their job holding on the rims, but the rubber itself parted company with the rest due to the level of forces from the high speed crash. You can’t protect against everything, and god knows if you are Niki Lauda you don’t want to anyway, but the FIA now have another incident to review carefully, and decide if there are any safety considerations to be taken away from it. If I were an F1 driver about to reach a milestone in Formula One, particularly a nice round number of races competed, I would keep it very quiet. Celebrating such statistics only seems to bring heartbreak. 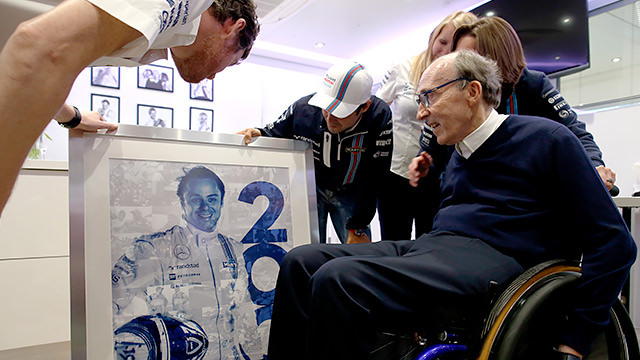 Felipe Massa was the victim this time around, enjoying a celebratory weekend for his 200th Grand Prix. A poor qualifying didn’t knock his mood too much, but the collision with Räikkönen eventually brought him back down to earth. The 200th Grand Prix ended with his car in pieces after just one lap. When Rubens Barrichello celebrated his 300th Grand Prix, in Belgium 2010, the Brazilian thought things were going well after qualifying. He picked up seventh place on the grid but Barrichello, also in a Williams, lost control on the first lap and crashed out of the race. This year, Jenson Button celebrated his 250th Grand Prix start in Bahrain. He ended up classified 17th, but not crossing the finish line due to a clutch failure. Fernando Alonso’s 200th Grand Prix ended not just in a retirement, but an embarrassing one. The Spaniard was recognising the anniversary in Malaysia 2013, but he finished in the gravel after choosing not to come in for a new nose. There are bound to be examples of drivers who get to the end of their milestone races, but the evidence weighs in the favour of keeping quiet about those growing statistics. You couldn't very well avoid the fact that Silverstone turned fifty shades of pink across the course of the weekend - all in memory of John Button, Jenson's father. It started with the t-shirts, a way of raising some money for charity and paying tribute at the same time. The idea gradually gained traction, so that even those who were contractually obligated to wear something else still found a way to sneak in some pink. Button even managed to turn his helmet a rather alarming shade of fuchsia, which got my approval as a tribute not only to his father but also to the helmet colour choice of one Franck Montagny. As mentioned above, special tribute race weekends don't always work out well, but for Button it was a weekend to remember. Third in qualifying and fourth in the race is a huge result for McLaren. I got so close to a podium finish – and I think it would’ve been so great for the fans to see Lewis and me up there together. I’m sorry it didn’t quite happen, but I want to say a big thank-you to all the fans, and to my family, and last but not least to the entire McLaren team – everyone has been so supportive this weekend. As well as a healthy points finish, Button comes away from Silverstone with the warm and fuzzy feeling of knowing so many people care about his family. We didn't manage to find anything pink to wear here on Sidepodcast, but we did the next best thing and turned the site a brighter shade of pale.